I had only seen Raviolios in an old cookbook from 1981 and just assumed they were discontinued since I never see them. 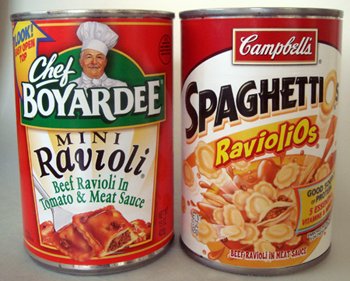 As an open request, if anyone has an ad or photo of an old Raviolio can, can I have a copy? I’d love to be able to use it on differentbutthesame. The grocery store near me is terrible and is always out of what I’m looking for, or the person at the service desk is rude or all the lettuce is wilted etc… and they didn’t have regular Chef Boyardee Raviolo, just 95% fat free, overstuffed, Italian sausage and mini. So I got mini and it actually worked out that they’re the same size as Raviolios! We were surprised that the sauce was kind of watery. In general, these were pretty bland. I do like how the pasta was mushy, for some reason it works so nicely in canned pasta. 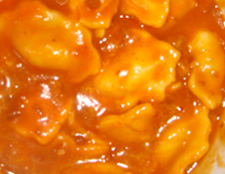 The meat in the ravioli was pretty much undetectable. It wasn’t bad though and Ethan called it “acceptable”. These are a little prettier to look at with their scalloped edges. They seem to be a filled more too and the meat filling has much more of a presence than the Chef’s version. Also we liked that the sauce was thicker and in general this product had more flavor. Ethan said it reminded him of pizza flavor so there’s probably a little cheese in there too. We both went with Raviolios. I was surprised since we favored Chef last time we evaluated him against a Campbell’s product. It wasn’t just the thrill of finding a product I thought was discontinued years ago but the Raviolios were much more satisfying consistency and flavor. I don’t eat canned ravioli but I’m sure it would be a change from the crap in the frozen foods section. walmart brand is the best. 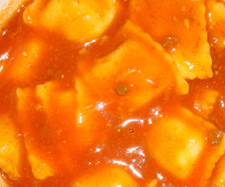 Thick, tomatoey, meaty sauce with chewy, meaty ravioli squares, i dream in it! Where in the world did you find Raviolios? Impossible! I got these at Dollar Tree. I was buying these up until a month or two ago, I figured they went on hiatus again when I saw them go on “super sale” for under $1/can. Should’ve bought the shelf lol. Ravioli O’s are far superior I agree. A surprise from a company that produces that other watered down travesty known as Spaghetti O’s. Certainly not premium but in every way better than the chef. I imagine many who voted chef have never even tried the alternative. I had no idea how regional these were. These things have never been off the shelves of the majority of our local markets (decades now) and are almost always on sale. If you are buying these you are already on a budget that isn’t going to be allowing surf & turf any time soon and as far as cheap food the Rav O’s are better than any chef offering or any entry level tv dinner….maybe not spiral mac & cheese (a true broke food staple am I right) which is the go to tailor park comfort food..nearly anything else thugh at the same price point really. I should point out for reference a can runs between $1 to $1.25 depending on sales in my area.